Unlike the North West, North East Issan does not boast much in the way of attractions but it does offer one outstanding candidate. 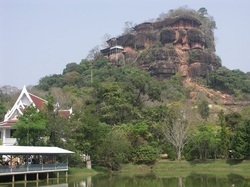 A full day is recommended and perhaps an overnight stay when visiting Wat Phu Tok. The travelling time from Udon Thani is too consuming and you need plenty of time to get the most from this temple and surrounding land.